Okay, I know I already did a post on Star Trek, but then i rewatched Star Trek Into Darkness, and I feel like I need to amend my comments on the movie. 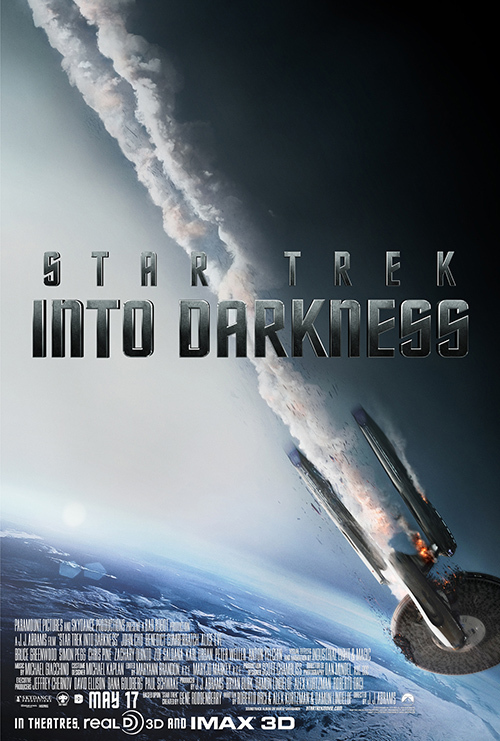 I still stand behind my statement that Into Darkness is not as good a movie as Star Trek Into Reboot 2009, but I would consider it within the top five Star Trek flicks. First of all, i don't hold Wrath of Kahn on as high a pedestal as many other fans. I like the movie. A lot. It's got action, intrigue, and Kirk doing all the things Kirk does best. But if you go back and watch the movie without the rose-tinted glasses, Kahn has a number of flaws. Firstly, it's not reality a very well constructed movie. It's a great flick, certainly, but there really isn't much plot to the film. Evil villain is introduced, we learn about a dues ex machina, evil villain strikes, and then action, action, action for the last half. While the main crew of the Enterprise-A is will served by the movie, most other characters don't get any background. An ensign is introduced as being "important" somehow, but then he dies in his next major scene. Kahn has a letutenant that advises him (and is honestly a better strategist), but he maybe has five lines in the whole movie, and we don't even know what hjis motvation is for following Kahn when Kahn so clearly is blinded by revenge. And, let's face it that Kahn is just not a worth adversary for Kirk. The only reason Kirk and the Enterprise crew were in trouble was because Kahn stole another federation ship. If he'd had any other ship, the Enterprise would have had their shields up, they would have blown Kahn out of the sky, and the movie would have been over in fifteen minutes. After the initial surprise, Kirk is always one step ahead of Kahn, double-crossing, cheating, out manuevering (who doesn't realize you can fight battles in 3D in space?!) and generally being Kirk all over Kahn's plans. All of my critiquing aside, I do think Wrath of Kahn is fantastic for what it does well. I just don't hold it up as the #1 Trek film that others would say it is. In case you're curious, my favorite is Star Trek VI: The Undiscovered Country. For my money, it takes everything Wrath of Kahn did well (intrigue and action) and adds a layered mystery on top. Characters have back-stories and meaning, there's whole swaths of actual plot, and the villain is a worthy adversary for Kirk (one who cheats just as much as Kirk does). Do I think we needed another Kahn movie? Between Star Trek II and Kahn's original series episode, "Space Seed", Kahn was well represented in Trek canon (plus, I'm sure there were more books and comics that expanded out Kahn's appearances in the extended universe). Into Darkness doesn't give us more of a character we were craving -- putting Kahn into the movie is really unnecessary, honestly, but unlike my first viewing, now I don't think it necessarily ruins the movie. One thing Into Darkness improves on over \Wrath of Kahn is that the newer flick has a story to it. Federation HQ is attacked by an unknown assailant, and the villain escapes to the Klingon homeworld, a place where the Federation dare not tread. Kirk has to lead the Enterprise crew on a mission to kill the villain (who, spolier, turns out to be Kahn). But then there's a whole lot of other stuff as well. Is Kirk a good captain? Can he an Spock ever really be friends? The admiral that sends Kirk and Crew to Klingon space seems to have additional motivations -- will we ever find out what those are? As indicated, there's a lot of story as well as a fair bit of mystery. Most all of the characters are well served, although Uhura (and, to some extent the new science officer, Carol) come across as love-interests for the male characters more than independent agents of the story. The one character, though, that I liked the least was Kahn, and I think that's because of the way he was played by Benedict Cumberbatch. I don't know if he was trying to do his best Ricardo Montalban and just couldn't pull it off, but instead of coming across as dark and menacing (with a hint of real Corinthian leather), Benedict's Kahn just seems over acted. A better performance would have made Kahn seem even more threatening (although they at least make him into a good foil for Kirk in the story). Most importantly, Into Darkness delivers just as many thrilling action set-pieces as Wrath of Kahn. My personal favorite is one nearing the end of the movie where the Enterprise's gravity has been throw off and the crew has to navigate walls that become "floors" and hallways that suddenly become sheer drops throw the ship. It's stunning work. As with the previous movie, there are some logic gaps (the end climactic fight in San Francisco hinges it's conclusion on an need for a particular item that could be covered by other characters still on the ship if you really think about it). And I know some people complain about the one scene that's an obvious nod towards Wrath of Kahn (not to spoil it, but when you get there near the end of the movie, you'll know it). For me, it wasn't a deal breaker, and on the second watching, I liked the writing, the lines between the characters, and the way the characters themselves sort of acknowledge that even in the reboot continuity, events have a way of repeating. So no, Into Darkness is not a perfect movie. It's not as good as Star Trek 2009, but it is well worth watching. If you're a die-hard fan of Wrath of Kahn you probably will have issues with this movie (as per many of the things I noted above), but I think the movie succeeds admirably as a successor both to Star Trek II and Star trek 2009. See Also: Galaxy Quest, Master and Commander: The Far Side of the World, The Orville (S1), "USS Callister", Top 10 Movies (2014), Top 10 Movies (2018), Let's Do the Time Loop Again!